The work at height industry knows many words that aren’t common knowledge. To provide a reference source we produced the work at height dictionary for fall protection. In this dictionary we explain some of the most common sets of words. Anchor points: A place where workers can attach their connection device to, to anchor them and prevent falls. Anchorage points: See anchor points. ANSI Z359: The Fall Protection Code set by the American National Standards Institute. The code includes safety requirements for equipment, requirements for training and fall hazard identification and requirements for third-party testing. Adhering to ANSI standards is voluntary, but regulatory bodies often refer to ANSI standards when creating their own regulations. Anti-pendulum anchor: An extra anchor point installed in areas where swing fall hazards exist. They are used in conjunction with a horizontal lifeline system of other single anchor points. Users remain anchored to the lifeline or other anchor point, and attach their lanyard to the anti-pendulum anchor. Attachment point: A D-ring on a full body harness to which a lanyard or fall arrest device can be attached. Automatic fall arrest device: A type of lanyard that unrolls, and retracts, depending on the user’s movements, ensuring that the lanyard is always taut. This device acts like a seatbelt when a fall occurs, stopping a fall within a fraction of a second. Also referred to as a self-retractable lanyard or self-retracting lifeline (SRL). Learn more about the automatic fall arrest device. Base plates: A supporting flat frame at the base of an anchor point, that helps stabilize the anchor point as well as distribute the forces exerted on the roof structure in case a fall is arrested by the system. Carabiner: A specialized type of safety connector, used as an intermediary for securing connection devices to anchor points and users. Also spelled as karabiner. Collective fall protection: A method for providing protection from falls from height that protects everyone who has to work in the area. Examples are guardrails and parapet walls (if they are high enough). Connector: Collective noun for equipment that allows a user to connect to an anchorage point with their connection device. Most common examples for fall protection are carabiners and scaffold hooks. Counterweight: Weights used to counterbalance freestanding guardrails. Deflection: The amount of displacement in a fall protection system when a fall A horizontal lifeline, for example, is more flexible and will give more in the direction of a fallen worker than a rail system. A rail system is more rigid and will not bend in the direction of a fallen worker. The amount of deflection is important in calculating the fall clearance. Edge protection: Fall protection equipment used to guard open edges, so workers cannot fall from height. This term is commonly used for guardrails set up during the construction of buildings. Emergency plan: A written plan in which the procedures for a rescue from height are described. Any workplace where work at height is executed should have such a plan. Also called rescue plan. EN standard: A European standard that provides rules and/or requirements of equipment and their use. For fall protection there are several different EN standards, for example EN 795:2012 Personal fall protection equipment – Anchor devices. Energy absorption: When a fall occurs a strain (force) is exerted on the person whose fall is arrested and on the structure. To protect the person from these forces a Personal Energy Absorber (PEA) needs to be used. To protect the structure, energy absorption methods need to be included in the fall protection system. Engineered systems: A fall protection system that is tested and validated by an engineer. Fall arrest device: See Automatic fall arrest device. Fall arrest: A working method in which protective equipment is used to stop a fall, should one occur. Working in fall arrest prevents the user from hitting a lower level or an object that’s below the working level. Fall clearance: Indicates the distance that’s available for a person to fall without hitting a lower level or object. Fall distance: Indicates the (required) distance between the attachment point and the lower level, or the first obstacle, in case of a fall. Read more about the fall distance and the fall factor. 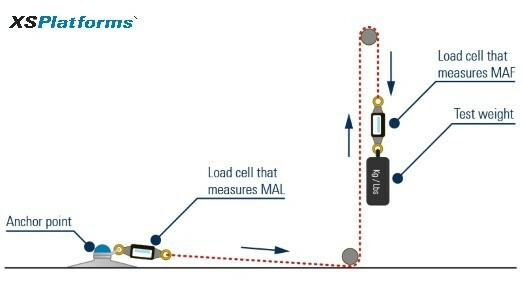 Fall factor: Indicates the ratio between the height of a possible fall and the length of the connection device available to absorb the shock of the fall. The higher the fall factor, the greater the need to absorb the forces released on the body. Fall hazards: Situations in which a person or an object can fall from height causing a danger to themselves or others. Fall prevention: Equipment and safety measures to prevent falls from height. Fall protection plan: Full documentation on what fall hazards are present on a work site, what fall protection measures are taken, what type of equipment needs to be used to combat the hazards, the training employees need to receive and have received and emergency procedures should something go wrong. You can download a fall protection plan template here. Fall protection PPE: Personal Protective Equipment specially designed for working at height, such as harnesses and lanyards. This equipment helps protect workers from falls from height. Fall protection systems: Safety measures that are taken to protect workers from fall hazards, this can be guardrail systems, lifelines, anchor points etc. Fall restraint: Protective work method that is meant to prevent users from reaching an area where a fall can occur, by restricting an user’s freedom. Also called work restraint. Fall through hazards: Situation in which a person can fall through a structure. Fragile roof surfaces and skylights can pose fall through hazards, but also insufficiently covered holes in a structure, e.g. during construction. Fixed guardrails: Permanently installed edge protection in the form of railings. This fall protection solution provides a safe zone for everyone working at height. Freedom of movement: The area a worker can travel/reach while safely connected to fall protection equipment. Freestanding guardrails: A guardrail system that is kept in place on a roof surface by means of counterweights. The installation of freestanding guardrails does not require any drilling (or penetrating) to the roof structure. Also called non-penetrating guardrail. Full body harness: A part of a personal fall protection system. The harness provides anchorage on the body for a lanyard. Thus connecting the user to the fall protection system. In case a fall occurs the full body harness will also help limit the forces exerted on the user’s body. 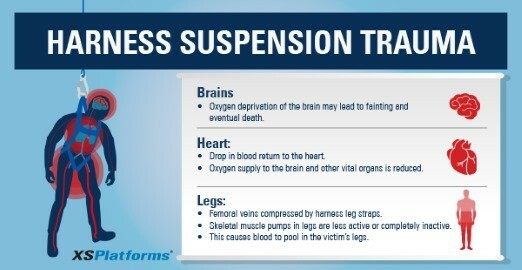 Harness Suspension Trauma (HST): A dangerous side effect of prolonged hanging in suspension. When suspended in a harness the blood flow of the human body can be disrupted, if this continues for some time the effects can be fatal. Hierarchy of fall protection: This is the preferred order of safety measures to prevent falls from height. The order is as follows: elimination, collective fall protection, fall restraint systems, fall arrest systems and lastly administrative controls. Also called the hierarchy of control. Lanyard: A safety cord that helps a user attach to an anchorage point. Lanyard come in different varieties of length and are most of the times equipped with a Personal Energy Absorber. Lifeline system: Consist of a series of anchor points that are connected via a steel wire-rope, the so-called lifeline. Workers attach to the lifeline track and move freely along the trajectory, without having to detach and re-attach. There are both horizontal and vertical lifeline systems available for safe work at height. LMRA: The Last Minute Risk Analysis. A LMRA is a short checklist that someone conducts before entering an unsafe area where fall hazards exist. Low-slope roof: The inclination angle of the roof, or roof pitch, determines whether something is a flat, low-slope or steep pitched roof. The definition may also differ per country. European Standards specify low-slope roofs as having and inclination of less than 15 degrees. In the USA OSHA defines low-slope roofs as having a slope of 4/12 or less (approx. 18,5 degrees). MAF: Maximum Arrest Force. This is the maximum amount of force that is allowed to be released on the body of the user when a fall is arrested. MAL: Maximum Anchor Load. This is the maximum load that will occur on an end anchorage when a fall is arrested. OSHA fall protection regulations: United States regulations regarding fall protection set by the Occupational Safety and Health Administration. Parapet: A barrier wall along the edge of a roof, bridge or balcony. There is no set height for a wall to be named a parapet. Some parapets are not high enough to also serve as fall protection measure (check local regulations to see the required height of a parapet for it to serve as fall protection). Pendulum effect: When a person falls, while having a longer safety line, they can swing back and forth in their fall, like a pendulum. During their swing they are at risk of striking a structure or nearby object, oftentimes with great force. Also called swing fall. Permanent fall protection: A type of fall protection that is installed permanently on a structure or building. Personal Fall Arrest System (PFAS): Fall protection equipment for those having to work in a fall arrest situation. The system consists of an anchorage system, a full body harness and a connecting device. The equipment works to protect workers from a fall from height by stopping their fall should one occur. Personal Protective Equipment (PPE): Refers to protective clothing, helmets, goggles or other equipment that protects the workers’ health and safety in workplaces or public environments. PPE Regulation (EU) 2016/425: EU regulation that sets standards for Personal Protective Equipment. Pre-use check: A visual inspection of Personal Protective Equipment for fall protection before each use. Minor damages or seemingly harmless abrasions/deformations may already affect the safety of the materials. If any damages or deformations are spotted the materials need to be recertified and/or replaced. Rail system: Consists of a series of anchor points that are connected via a rigid rail. Worker attach to the rail with a special slider and can travel the length of the system. Recertification: When a fall protection system is damaged or has been involved in a fall accident, the system will need to be recertified. This is mostly done via the installer/manufacturer of the system. Rescue plan: A plan that details rescue procedures should a worker fall and hang in suspension. All workplaces where work at height is executed should have a rescue plan. Risk assessment: An evaluation of the workplace that identifies all potential hazards that exist and what measures and equipment need to be implemented to keep everyone safe. Roof access policy: A procedure to monitor who has access to your roof, to prevent unauthorized personnel from accessing dangerous situation. Rope Access: A form of work positioning by lowering oneself from the anchorage area. Also called abseiling or rappelling. Runner: A runner, also called slider or traveler, that allows users to anchor to a lifeline or rail system trajectory. A runner moves along with the user, along the system, to provide freedom of movement. Safe zone: A zone on top of a roof where there are no fall hazards present and where no fall protection is necessary. They are often located at 2-4 meters (depending on local regulations) from any unprotected edges. Safety culture: A set of shared believes, practices and values within an organization that encourage safety in the workplace. Safety harness: A form of PPE designed to keep a person from injury. The harness is connected to a stationary anchorage point via a connection device, for example a lanyard. Self-retracting lanyard (SRL): See automatic fall arrest device. Sharp edge protection: A term that states that a connection device is protected against tearing and breaking when they slide past sharp (roof) edges. Shock absorber: See Personal Energy Absorber. Steep slope roof: The inclination angle of the roof, or roof pitch, determines whether something is a flat, low-slope or steep pitched roof. The definition may also differ per country. European Standards specify steep slope roofs as having and inclination of more than 15 degrees. In the USA OSHA defines steep slope roofs as having a slope greater than 4/12 (approx. 18,6 degrees). Swing fall: See pendulum effect. Temporary anchor line: A strong kernmantle rope that can, temporarily, be used in between two anchor points. This provides users with more freedom of movement. Temporary fall protection: A type of fall protection can be removed and set up on another location. Toe boards: A long piece of wood, metal etc. that’s attached to the bottom of a guardrail system, or scaffold. This board prevents tools and equipment from falling from height. Tool tethering: Securing a tool with a tool cord to anchor point so it cannot fall from height. An anchor point can be a wristband, work belt, harness or part of the structure that’s being worked on. Work at Height Regulations 2005: UK regulations that apply to any work that is executed at height. Work at height: Work at any elevation or place where a person can fall a distance that can cause an injury. Work positioning: A fall protection system that allows the user to stay firmly in place so that both hands can be freed for performing delicate tasks. An example of this work method, is work executed on the side of a tower. XSBase plate: A base plate for anchor points developed by XSPlatforms. Meant for installations on concrete roofs, plywood roofs, or trapezoidal roofs with insulation. XSBending kit: a mechanism, installed on an anchor point that bends in the direction of the fall. This helps prevent damages to the structure in case a fall occurs. XSDynamic: a mechanism installed in a lifeline system that provides absorption in case a fall occurs. The spring inside the XSDynamic is stretched when activated by a fall, increasing the deflection of the lifeline. This helps prevent damages to the structure in case a fall occurs. XSFlex: A freestanding guardrail that is held in place with counterweights. This system can also be folded down so it isn’t visible when it isn’t being used. XSGlobe: An anchor point with a safety eye that can rotate 360°. The XSGlobe can be used as a single anchor point or as an anti-pendulum anchor. XSLinked: A horizontal lifeline system developed by XSPlatforms. 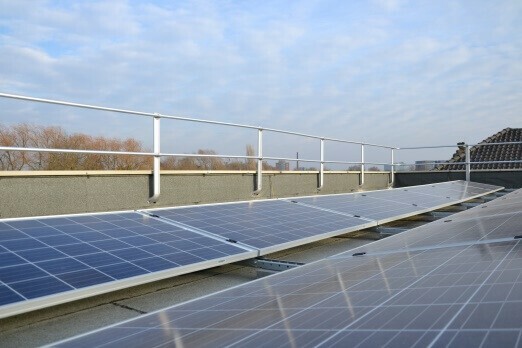 This system can be installed on roofs, walls and overhead structures. This single cable lifeline solution can be used by up to three users depending on the installation method and surface. XSMD: A base plate for anchor points developed by XSPlatforms. Made for trapezoidal steel roofs without insulation. XSParapet Fixed: A type of guardrail that is mounted on top or on the inside of the existing parapet. 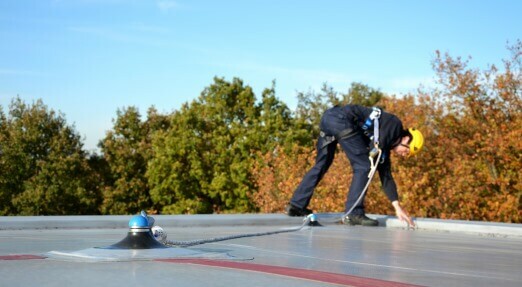 This form of fall protection provides safety for all those on top of the structure. XSPlatforms’ bird’s eye mini: a permanent anchor point solution for wall with a visual fall indicator. XSPlatforms’ LinkedPro: A multi-cable lifeline system developed by XSPlatforms. This system can be installed on roofs, walls and overhead structures. The multiple lifelines allow users to pass one another without having to disconnect, offering ultimate safety. Up to six users can be attached to the LinkedPro lifeline system, depending on installation method and surface. XSPlatforms’ RAP Globe: An anchor point with a safety eye that can rotate 360°. This safety eye can also be used for work on sloping roofs or for rope access/abseiling. XSPlatforms’ RAP: An attachment point for rope access/abseiling that can be added to a horizontal lifeline system. XSPoint: A starting point of an XSPlatforms horizontal lifeline system. In combination with the XSSlider Pro this starting point ensures that users cannot disconnect from the system in an unsafe zone, only at the XSPoint. XSRail: A rigid horizontal rail system. This system can be compared to the horizontal lifeline system, but it has less deflection should a fall occur. XSSlider Pro: A runner, or traveler for the XSPlatforms horizontal lifeline systems that allows users to move along the system. This slider was specifically developed for use in combination with the XSPoint, ensuring that users cannot disconnect from the lifeline in an unsafe zone. XSSlider: A runner, or traveler for the XSPlatforms horizontal lifeline systems that allows users to move along the system. XSWall Fixed: A type of guardrail that is mounted on top of or on the inside of the wall. XTrusion: A base plate for anchor points developed by XSPlatforms. This base is meant for roofs with trapezoidal or standing seam profiles and is installed with special clamps.